Thanks to a heads-up from a friend, I was able to get out to Billy Goat C for a little while a few days ago and shoot harbinger-of-spring. Still not much else to report, except more spring beauties are opening. Also happy to report that parks personnel are applying herbicide to lesser celandine, a particularly nasty invasive alien that hides behind cheery yellow flowers; plants quickly form a monoculture and are difficult to eradicate. I also hiked about 2/3 of Billy Goat B. High water made it tricky in one spot, and I bailed before getting to the area where the worst damage is, but the trail has finally reopened. I saw nothing blooming there except spring beauties. But with warm weather, plants will emerge and bloom fast. Interested in finding bloom dates for particular species? Scroll to the top and pull down the menu for plants by either common name or binomial to see observed bloom times in past years. 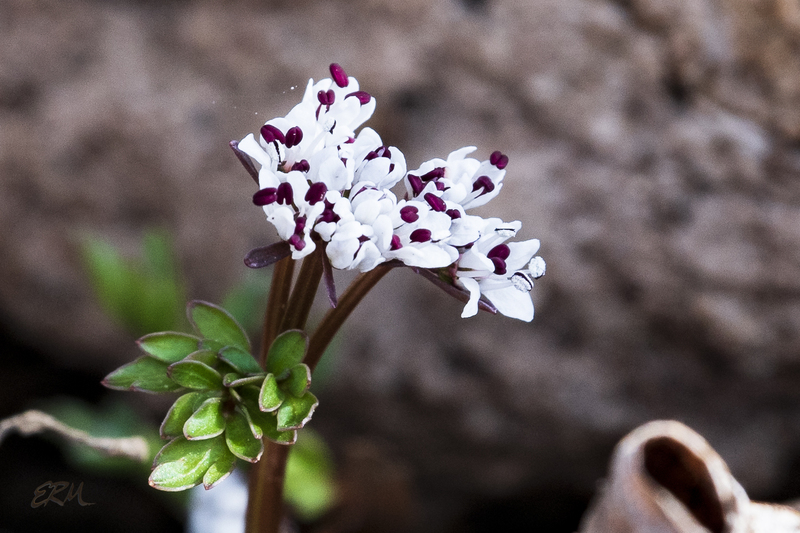 This entry was posted in Uncategorized and tagged Claytonia, Erigenia by elizabeth. Bookmark the permalink. sorry to hear that you have lesser celandine (or possibly less ……). It’s a native species here, although there are two forms (one with bulbils one that spreads purely by seed – I think). It gets everywhere, though (fortunately) it being native means that other plants here are capable of fighting back and preventing it taking over, so we, at least, can enjoy it for what it is and not worry! Love your blog, by the way!. Not many dare to condone the use of herbicides. Our inability to use them is a very serious problem here, as seriously invasive exotic specie continue to conquer the ecosystem. People who think that they are ‘environmentalists’ want the invasive exotics to be protected as if they are natives, and actually protest vegetation management and the removal of Acacia dealbata from utility easements. Hi, this isn’t topical (I’m so sorry about that) but I am trying to contact you because of a post you made on donrockwell to do with Top Tea back in 2007. We can’t find the tea anymore and are looking for any leads about what to replace it with. May I contact you? I’m at pastabooks@gmail.com Thank you so much. Well, the store I bought it at is in the post: Yekta. It’s on Rockville Pike in Rockville, MD. I don’t recall much about it, though, so I don’t know how much more help I can give. I haven’t bought it since. I see, thank you! 🙂 Yes, I checked, certainly, but Yekta doesn’t have a store online. Did you happen to learn anything more about that kind of tea? Have you ever had another tea that tasted like it that you can recall? I’m sorry, I never did learn anything more about it, and I haven’t bought any since. Went up to Carderock on Sunday to enjoy woodland solitude with 100,000 other people. Glad I didn’t wait to avoid crowds — so much is already blooming. 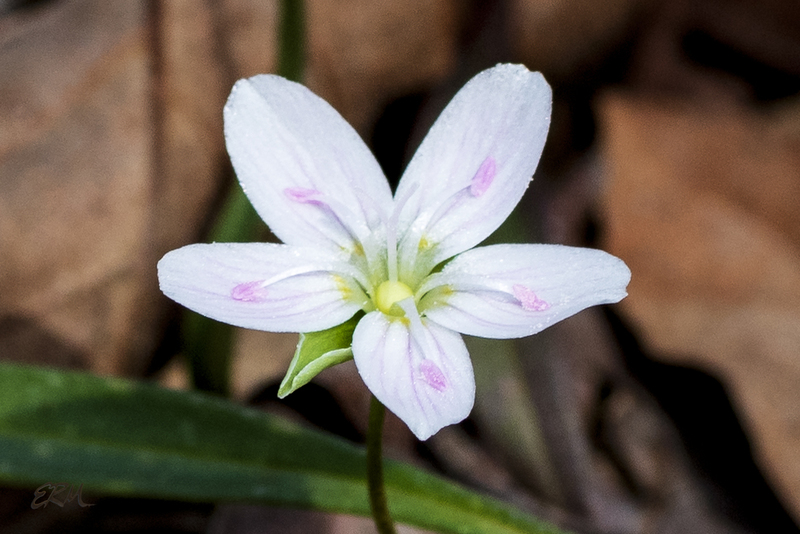 Spring beauties, cutleaf toothwort, harbinger of spring, round-lobed hepatica (1), trout lily (1), leatherwood, spicebush (1), dutchman’s breeches (a few), bluebells (a few), bloodroot (6-8). Toadshade in bud already. With warm weather on tap all week, it’s going to happen fast! I was going to write an update later today, but you beat me to it! Also, you saw a lot more than I did. Were you just in the immediate Carderock area? I would assume so unless there’s another stand of leatherwood. Everything I mentioned except the bloodroot and the spicebush was right around Carderock. The trout lily and Dutchman’s breeches were right under the leatherwood. (The leatherwood I know about is around the corner from the sessile bellwort patch by big rocks. ) Hepatica was up the hill above the toadshade patch. The bloodroot I saw was in the former Marsden tract day use area. Spicebush was across the dry canal bed. Forgot to mention early saxifrage, also at Carderock. And I think there should be a rue anemone there by now. Also, have you seen the washed-up sand on Billy Goat B? Poor bluebells look like they’re growing on a beach. I walked BGB yesterday. Sure looks different, doesn’t it? I found a spectacular stand of harbinger-of-spring off a side trail. The neat thing about the bluebells, though, is that they’ve beaten the aliens to it. So far, anyway.